Viking offered their first world cruise that for us started in Los Angeles January 5, 2018 and ended in England on May 5, 2018. 4 months, 25 countries and 52 ports. I can&apos;t say enough how much the crew on Viking exceeded every expectation and provided customer service that was 5 star ++! You can not imaginine how efficient being on board ship allows you to make the most of your time, not only while at sea but also when at a port of call. Viking offers included tours at every port of call, along with many optional tours at each port. You can also go ashore in most countries and tour on your own. Most, not all ports, are very closet to if not right at city centers or you can take a taxi or "Tuk Tuk" to your desired destination. While on board Viking ships, 6 now in use and I believe another 8 or more under construction, there is so much offered that you can either choose to participate or not. We enjoyed the "Trivia" sessions where when at port for 1 hour you team up and play Trivia answering 15 questions and then a final team playoff. You not only learn a lot but get to meet so many new friends. The nightly entertainment was exceptional and changed as new top notch tallent came on board every few days. Most important is Viking&apos;s service. I expect a high level of service and my expection was exceeded time after time. Their staff from the Captain, first mate, Cruise Director, Hotel Manager, Chef and down to each employee treated you like family with smiles and chit-chat. We have already booked another cruise with Viking and are looking forward to seeing many old friends and can&apos;t wait for our next adventure on Viking. Don&apos;t wait or procrastinate, your own "Trip of a Life Time" is waiting for you...you won&apos;t regret it as you will have so many adventures and meet so many new friends to share your experience with on board Viking. Go see, experience new countries and share with your friends. Have lots of fun! 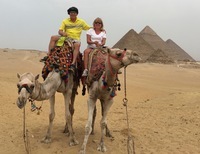 Egypt at the Great Pyramids! Stewards were so responsive, friendly and a joy to have helping us with any need we had from ice, extra towels, and much more.